Although arthritis is among the top three chronic diseases in Canada, it continues to be vastly misunderstood. Many perceive it as an “older person’s disease.” The fact is that 60% of the nearly 4.5 million Canadians with arthritis are under age 65. And, to many people’s surprise, one in 1,000 children in Canada has arthritis. In the fall of 2009, Arthritis Consumer Experts and The Arthritis Society launched a National Arthritis Awareness Program (NAAP) across Canada to inform the public about arthritis. As part of the NAAP, the arthritis community “hit the streets” in Vancouver, Calgary, Ottawa, Toronto, Montreal, and Halifax to share information about the “Arthritis is cured! (if you want it)” program. With the help of volunteer “Ambassadors”, we distributed over 100,000 informational brochures aimed to debunk myths and change Canadians’ perceptions of the effects arthritis has on our communities, our families, and our lives. Informing the public is, however, only one side of the equation. Out of four years of medical school training, a family physician receives only about 17 hours of training on the over 100 different types of arthritis and related diseases, which may mean it will be difficult for some patients to get a referral to a rheumatologist. Arthritis diagnosis and management begins with Canadian primary care practitioners. To assist them with the diagnosis and management of arthritis and in discussing arthritis with their patients, the NAAP is now focusing on engaging primary care professionals by providing them with a “point-of-practice” tool to help them efficiently and effectively identify and treat arthritis. Early diagnosis and appropriate management strategies are vitally important when dealing with all forms of arthritis to help prevent joint damage and keep people healthy, to reduce pain in the presence of arthritis, and to lessen the threat of permanent disability. To aid physicians with diagnosing and managing their patients’ arthritis, the National Arthritis Awareness Program’s co-leaders, Arthritis Consumer Experts and The Arthritis Society, have developed a practical, arthritis point-of-practice tool which can be used in a physician’s daily practice. The content for this tool comes from the evidence-based Best Practice Guidelines for arthritis developed by and for primary care providers as part of the “Getting a Grip on Arthritis” program (© The Arthritis Society). Digital versions of this invaluable arthritis point-of-practice tool are available in two sizes (in both French and English) and can be downloaded from our website, at www.arthritisiscured.org/resources/professional. Alternatively, copies of this tool can be ordered by email. Please contact us at info@arthritisiscured.org. For the national arthritis awareness program to be successful your support, as part of the Canadian arthritis community, is important. Ambassadors: Volunteers who represented the NAAP during phase one by being a presence on the streets and handing out brochures to get the word out about arthritis. NAAP: National Arthritis Awareness Program, a joint effort of The Arthritis Society and Arthritis Consumer Experts to educate the public about the prevalence of arthritis and to provide a tool for doctors to help them diagnose and treat arthritis before the disease results in deformity and disability. Point-of-practice tool: A diagram indicating “hot spots” and a list of symptoms for both osteoarthritis and rheumatoid arthritis – a practical tool, which incorporates evidence-based information to support arthritis diagnosis and management and can be used in a physician’s daily practice. Primary healthcare provider: Family physician. 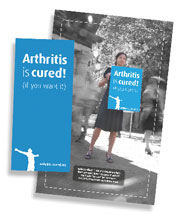 An arthritis point-of-practice tool, information, posters, brochures and other useful materials are available for download on our website at www.arthritisiscured.org. Materials are available in French and English. Today, there is no known cure for arthritis, but we believe a cure can and will be found if Canadians start talking about arthritis. Our message to Canadians is “Arthritis is cured! (if you want it)”. For more information on this awareness program please visit www.arthritisiscured.org. If you have an interest in becoming involved or to receive more information about the program send an email to info@arthritisiscured.org. The nearly 4.5 million Canadians living with arthritis deserve our best efforts and support. Distribute materials in your community and workplace and spread the word. You can contact us to get brochures, or download these materials from the Resource Kit section of our website to print in either colour or black and white. Share the video, created to help raise awareness about arthritis, available on www.arthritisiscured.org with your family, friends, and colleagues. Become a fan on our “Arthritis is cured! (if you want it)” Facebook page - tell your network about the significance of finding a cure for arthritis and encourage others to become a fan. Send an email from the website to tell someone about the “Arthritis is cured! (if you want it)” program and get the message out about the need for all Canadians to help find a cure for this devastating disease. Display an “Arthritis is cured! (if you want it)” poster in your workplace or in other locations throughout your community. Posters can be downloaded from the Resource Kit section of our website in colour or black and white. Help us find a cure by donating to arthritis research and encouraging others to do so as well. We hope you will participate in and support this ambitious and unprecedented program for arthritis awareness in Canada.